The former RTÉ journalist, who founded social media agency Storyful, decided against a move to the US. THE FOUNDER OF Dublin-based social media company Storyful, Mark Little, is leaving his role as managing director of Twitter Ireland just months after taking the position. In a statement, Little said that Twitter had been considering changes to the structure of its ‘media partnerships’ team, which he had led in Europe. “In October, the decision was made to restructure the team and locate its leadership roles in the United States,” he said. “I was asked to consider a possible return to the US, where I was living when I joined Twitter, or building on my role as Twitter’s Managing Director in Dublin. A Twitter spokeswoman confirmed that Little will step down from his dual role as managing director of Twitter Dublin and vice president of media in Europe. 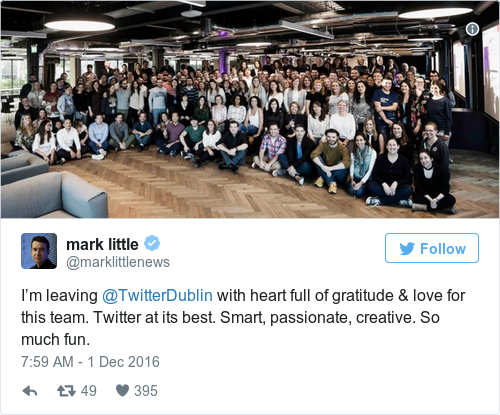 “We want to express our gratitude for his exemplary stewardship of Twitter Dublin and for leading our European media team over the past 12 months,” she said. Little was with Twitter for about 12 months, initially taking up the role of vice president of media in Europe about a year ago. The former RTÉ journalist is the founder of Irish news agency Storyful, which was bought by News Corp in late 2013 for €18 million. Little announced his resignation as CEO of Storyful in December 2014, initially staying on with the organisation as director of editorial innovation. In June Little announced he would take over as managing director at Twitter Ireland. The news comes as Twitter looks to overhaul its corporate structure amid mounting losses and relatively static growth in its user base. It was announced in October that Twitter is cutting about 9% of its employees worldwide. The social media site has failed to keep pace with rivals Facebook, Snapchat and Instagram. The cuts to the company were revealed after a possible takeover offers from the likes of Google and Salesforce failed to materialise.